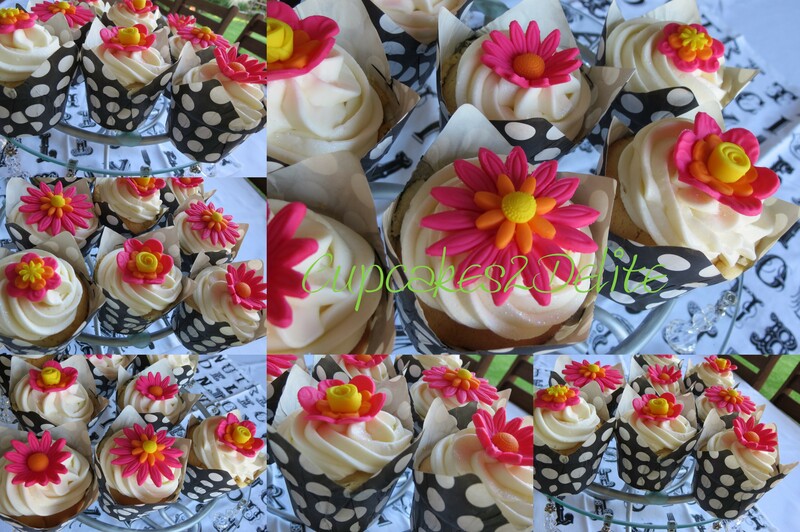 What more could a bride ask for than these gorgeous bright pink daisy cupcakes for her wedding day? I chose bright pink, orange and yellow to give a brilliant contrast to the black and white cupcake holders I use for so many of my cupcakes. These colours are the inspiration from a true African summer. The flat and shaped daisies and flowers I made using a bright pink sugar paste and added the orange and yellow centres, some repeating the daisy pattern and others with a rolled rose for the centre. The result is a beautiful array of cupcakes almost too pretty to eat…….but definitely too tasty not to eat!